Closets by nature are designed to collect and store. When they’re fulfilling their function, space is well used and organized. Unfortunately, it’s all too easy to keep filling and avoid cleaning. We’ve all had that experience of finding a forgotten favorite item because it got buried at the bottom of a pile. Triage and Purge. 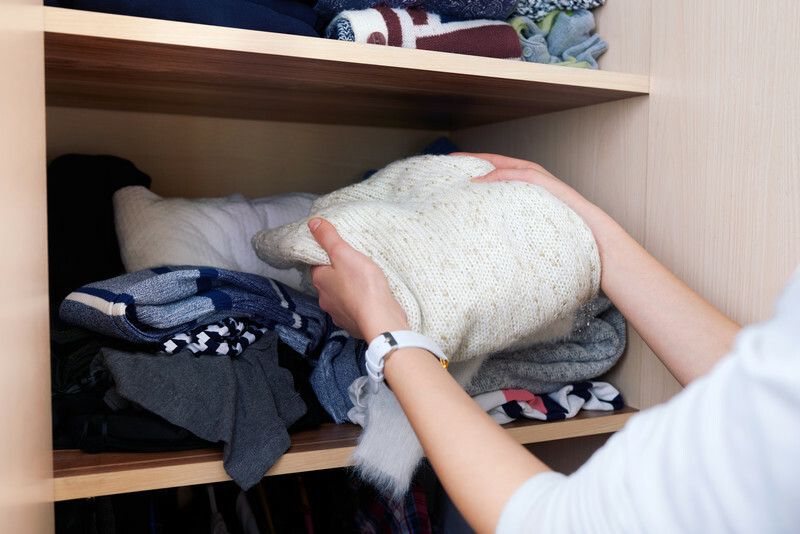 When it comes to closet clutter, unused items are your worst enemy. The New Year is the perfect time for fresh starts. Use that mindset to your advantage to thoroughly evaluate what you’re hanging on to, then donate or recycle any and all unused items. Take a seasonal approach. The main part of your closet should contain in-season and all-season items only. Bins that can be stored under your bed or stacked in another nearby area are a great solution for everything else. Get creative with your available space. Is there a need to add or remove a bar? Is there wall space that could accommodate a shelf, rack or hooks? Is there room at floor level for a rolling cart or bins that would maximize space? Start with these questions and see where it takes you! A good rule of thumb to keep in mind as you make changes: your most frequently used items should be at eye level; go up or down from there with less frequently used items. Is your door doing its duty? If your closet has a door, make use of the space available on one or both sides with overdoor hooks, racks or organizers. However, if your door gets in the way or hinders easy access to certain areas, consider removing and replacing it with a hanging curtain or other fun divider. Dedicate space for items that need attention. An easily accessible hook for your Klinke’s Express Bag is a must. In addition, if you’ve created more space in your closet with the help of these tips, use it wisely. You might add a laundry sorting station or a basket for things to donate. In addition, include a spot for items that need minor alterations or have broken zippers, missing buttons or small holes – bring them to Zip n Stitch so they can be quickly restored to good wearable condition. Keeping clothes and accessories organized and properly stored is one of the best ways to extend their life and keep them looking their best. Happy New Year, we look forward to serving you in 2019!